The great Hen Haul of 2015. If you’ve ever eaten maitake mushrooms, you’ve eaten Hen of the Woods (aka Grifola frondosa). Whatever you call it, this meaty bracket fungus has excellent taste and substance. 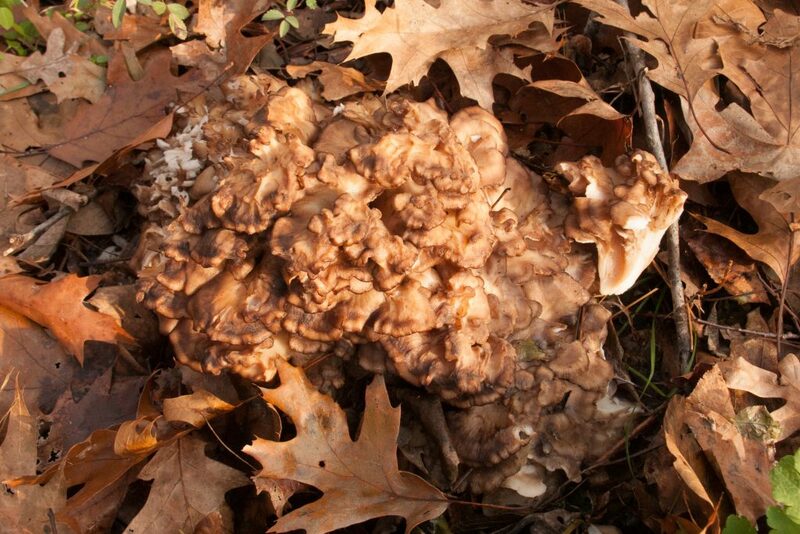 Hen of the Woods is a polypore, which means that its undersides have pores, not gills. It usually grows at the base of hardwood trees or from underground tree roots, and is a perennial mushroom. You’re likely to find it growing in the same place, year after year, until it kills the host tree. 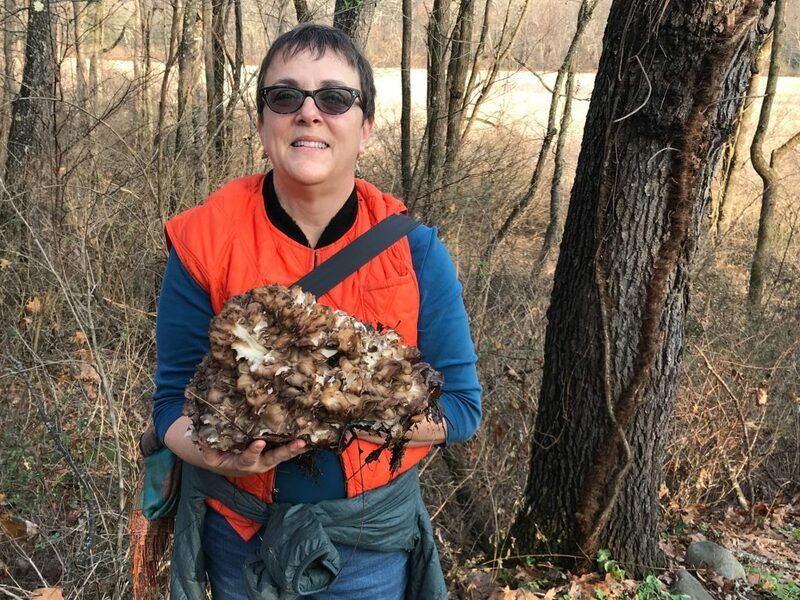 Hen of the Woods can be hard to spot in its native habitat. Since its color is somewhere between that of oak bark and that of fallen oak leaves, you need sharp eyes for this treasure hunt. I’ve stood next to a friend who stood next to a hen, and for the life of her, she couldn’t see it! When you do spot one, you’re likely to make a major haul. It’s not unusual for a large hen to weigh many pounds. 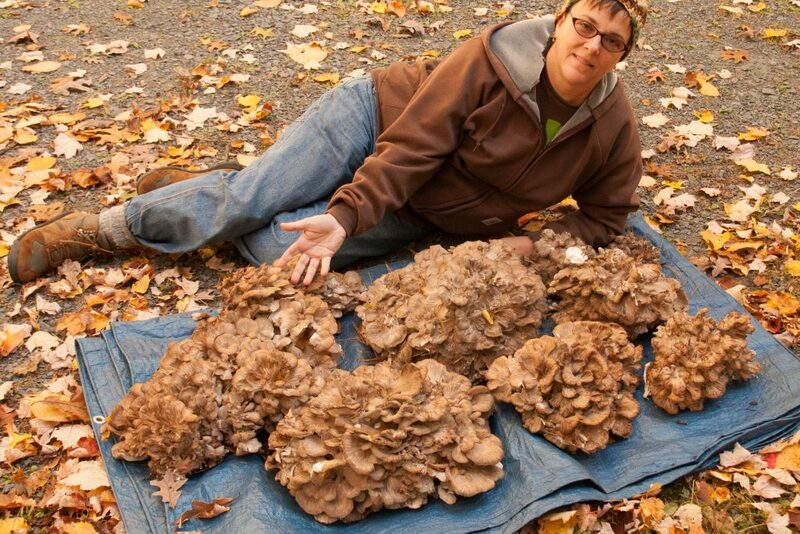 Hen of the woods is a fast-growing, early fall mushroom that appears after a good, soaking rain. I’m guessing it got its common name because someone thought it looked like the ruffled feathers of a hen, although I think that’s a stretch. It has no poisonous look-alikes, which makes it an excellent mushroom for beginning foragers. Superficially it resembles one other mushroom, the black-staining polypore (Meripilus sumstinei). Fortunately, this is also edible, although not as delicious as maitake, so if you make a mistake you’re in no danger. Btw, you’ll know right away if you’ve picked the black staining polypore…they don’t call it black-staining for nothing. It takes days for the color to wear off your fingers. Numerous gray-brown caps or brackets (with white undersides) branch off of a thick, fibrous white stem. Older specimens may be tough and buggy, so break off a few pieces before harvesting a giant clump. If it smells fresh and looks free of insects, carve yourself off a hunk and bring it home. Hen of the woods is substantial enough to be served as a main course. I hesitate to say meat substitute because it tastes nothing like meat. But it adds meat-like substance to pasta dishes, casseroles, egg dishes, and stir fries. The brackets are the tender, choicest parts of the mushroom. At least once in your life, try roasted hen of the wood caps. Break off bite sized pieces, toss them in butter or olive oil, salt, and pepper, then spread them on a cookie sheet and bake at 400°F for 15 minutes. Check and turn/stir to cook evenly, then return to the oven, checking every 5 minutes until the edges just start to turn crispy. I can’t begin to describe how delicious these are. It’s the purest way to enjoy their flavor. And don’t throw away that tough, fibrous stalk! It can be used to make mushroom stock, or minced and made into duxelles. Maitake is one of the few mushrooms that can be frozen without blanching or cooking. Clean it, cut it into pieces, then freeze. It’s as simple as that. This year I found a tender, clean hen MUCH later than usual, after we’d already had several hard freezes. Usually, by this time of year, hens are buggy, tough remnants of their former selves. I can only guess that this one got a late start, then was perfectly preserved by our unseasonably early snow. The insects either never found it (because of its late emergence), or were killed off by the freezing temperatures. Many other mushrooms would have turned to glop after freezing and thawing, but remember, hens can be frozen raw, and this one was as delicious as if I’d picked it fresh. This hen was a late bloomer, surviving snow and several hard freezes.